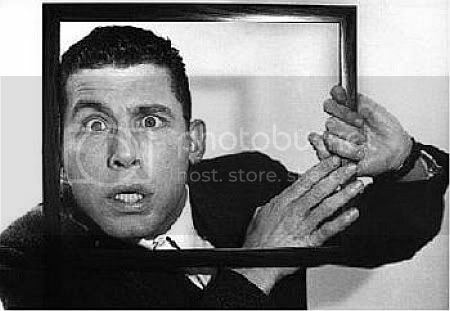 Now can you guess what comedian was born with a hole in his heart, and was named after the Rock and Roll singer, Jerry Lee Lewis? No. It's not, Richard Ayoade, silly. It's that other clown. What's-his-face. You know. That chap seen in this 60-minute stand-up show recorded in 1994. Johnny something. Hey, comedy-fans. Quick question. What do you get if you mix together a royal theatre, a large studio audience, and a funny looking man who talks about the following subjects? (1) Television. (2) Toilettes. (3) Parents. (4) Human behaviour. (5) Jobs. (6) Sports. And (7) Dating. No. You don't get that! You dirty-dirty fan you. Please allow me to add that the funny man in question sweats a lot, mimes a bit, and is very-very-very animated on stage. Yes! Now you got it, pal. 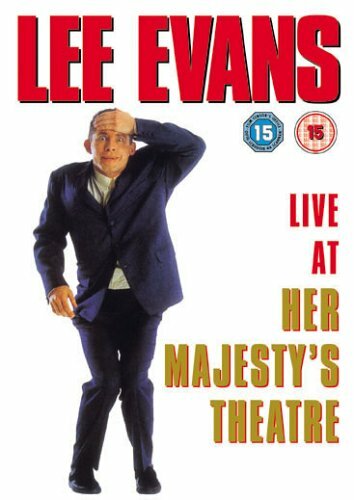 It's Lee (Plastic-man) Evans live at the Royal (balls) Theatre. In fact, Lee's so f*cking live, I feel compelled to relay to you some of the stuff he comes up with. Hello. Is this group therapy? Look at the suit I'm wearing. It's crap. It was supposed to be a lawnmower. I lost my dog last week, and put up an advert that said 'Phhhhht! Here Boy!'. It's so hard up Manchester, that they don't shoot people with guns; they insert bullets onto people manually. Me and my folks used to live in a one room bedsit, and it confused me when my Dad told me to go to my room. I got run over because of my Nan. I was standing in the middle of the road and she forgot my name when the car came along. Why do people speak quieter the farther away they are? Take two bottles into the shower? No. Not me. I'm bald. Televised chess... why? I try to make it more exciting by fiddling about with the volume and the contrast on my remote control. How come things are more expensive the more worn down they are? Juvenile crime is getting younger and younger, one day sperm will be able to rob banks. If you see someone getting mugged on the street, should you help them out? I think you should. Just as long as you get your share. News is only news if it's bad. Now in closing his show, Lee graciously thanks his audience, TANKS! Before briefly popping off stage, POP! Taking a sip of water, SLURP! Then coming back again, and throwing his sweat-stained-towel at them during his earnest encore. POW! What a funny guy! 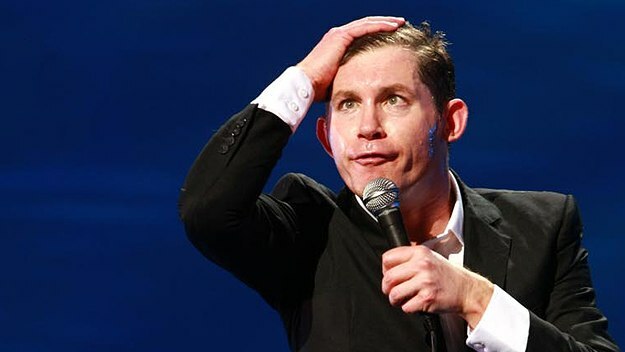 Now to be absolutely honest with you, folks, I'm not really sure how to write this review on 'Lee Evans - Live at her Majesties'. Hey! That's not to say that this show is so middle-of-the-road, I can't think of anything nice to say about it. No. Far from it. In actual fact, I thought it was a brilliant show overall. Parts of it reminded me of a live gig by someone like Robin Williams. Whereas other parts of it reminded me of a gag-fest by someone like Bill Hicks. Yet, whilst saying that, the strange thing about this comparison is that Lee isn't anything like Robin or Bill at all. In my eyes he's like an animated version of a stand-up comedian. Saying whatever it is he wants to say, with such expression, and with such humility, it's as though his stuff is uniquely his own. I mean, just look at the numerous pictures of him scattered throughout this article, and tell me that you know of another modern day comic that appears that funny without saying a single word? Alright. I know that there may be one or two. But please remember, I did carefully insert the phrase 'modern day' for a very specific reason. Because in my own opinion, Lee is like an old-school comedian with present day sensibilities. Hey! Check out how he starts off this gig for instance. First, he puts on an old fashioned record on a record player. Then, he follows the cheesy instructions omitted from it. And finally, for the next ten minutes or so, he saunters around the stage like a monkey with an itch to scratch, attempting to do what the record tells him to do (i.e. be funny). But can you see what he's really trying to accomplish here, comedy fans? He's putting himself on the same level as his audience. Giving us -- the spectator -- the opportunity to join in with him, and engage with his shenanigans come what may. Furthermore, because Lee isn't very rude on stage, and is generally quite a congenial and warm chap, you can't help but like him. It's who he is. A genuine man that genuinely wants to make people laugh.